Katy is the clinic manager at Bay State in Brockton, having been with the company since early 2013. She has advanced certifications including becoming an Orthopedic Certified Specialist (OCS) by the American Board of Physical Therapy Specialties in 2017. She also attended the Institute of Orthopedic Manual Therapy in 2015 and received IOMT Level I certification. Katy graduated from Simmons College in 2013 with her Doctoral degree in Physical Therapy, during her time at Simmons she was a member of the tennis team and attended the NCAA tournament for 3 years. 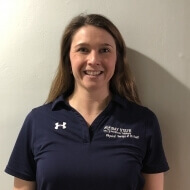 Katy developed a passion for physical therapy beginning in high school that intensified with her own history of receiving PT for a foot injury in college. Katy treats a variety of orthopedic injuries with a focus on restoring function to pre-injury status.